It’s the pinnacle of human emotion. Of all its finer qualities, empathy has long been considered to occupy the apex of humanity’s emotional development. But maybe the modern quest to increase everyone’s empathic abilities – from police officers and politicians to doctors and teachers – is misplaced. In a book that turns everything you thought about being a good person on its head, Yale-based psychologist Paul Bloom dissects our most cherished emotion and finds it lacking. Sure to make you think, Against Empathy is an interesting trip into the depths of human psychology. After meticulously defining what empathy actually is – it’s much more than simple compassion or concern for others – professor Bloom proceeds to pick it apart. Citing copious research, he describes the many ways that empathy tends to cause more harm than good, from governmental policy to intimate relationships. He even invokes empathy to explain why warfare is so common throughout human history. As he showed in Just Babies (2013), the author is gifted with the ability to present complex arguments with precision and clarity, often displaying a self-deprecating wit as he acknowledges the thin ice on which he’s meandering. Not surprisingly, he hasn’t found many supporters in his quest to quash the most esteemed of human emotions, but he isn’t afraid to go it alone. At the same time, he uses much of the book to address many of the criticisms he’s encountered as he’s promoted his anti-empathy agenda over the past few years. 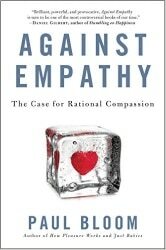 Really an argument for moderation in all our emotional exertions, Against Empathy makes a convincing case that compassion almost always trumps empathy. It’s an important distinction with a difference and recognizing the many ways that empathy can fail us is an intellectual effort well worth making. In the final analysis, you might not end up agreeing with the man. I’m not sure I do. But it doesn’t really matter, as this exploration of morality is a consistently fascinating and entertaining trip either way. Check out my review of Just Babies.